In late 2010 an interesting rum crossed my path, one of my first from Asia, the Phillipine Tanduay Superior 12 year old, which I thought was quite a nice rum at a time when double-digit aged rums were often beyond the reach of my slender purse (or the interest of importers). Re-reading that review after a seven-year gap I wouldn’t change much…maybe the word “excellence” in the final summing-up is a bit to enthusiastic (blame it on my youth and inexperience if you wish). What’s interesting about the review is the observation about the sort of oiliness displayed by the DDL aged expressions which subsequent tests (unavailable at the time) showed to be locally-traditional, profile-pleasing, unacknowledged adulteration – but that 84-point score for the T-12 remains, I believe, quite reasonable for its time. These days I’d probably rank it somewhat lower. To this day Tanduay remains generally unavailable in the west, in spite of being one of the major brands in Asia, the most popular in the Phillipines, and among the top five by volume of sales in the world. Yet they are one of the older concerns in Asia, being formed back in 1854 when some local Spanish entrepreneurs in the Phillipines formed Inchausti Y Cia – the company was mostly into shipping and fibre production and acquired a pre-existing distillery in 1856 so as to vertically integrate their sugar export business with distilled spirits. 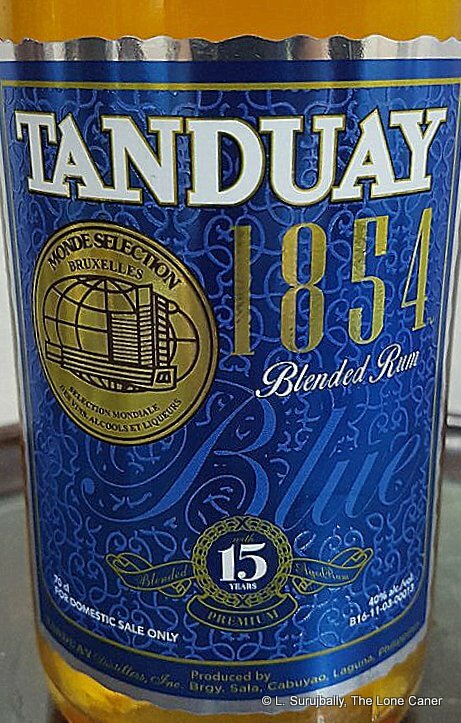 Tanduay rums have been around, then, for a long time (one of them won a gold medal in the Exposition Universal in Paris in 1876) and like many national brands as they grew, they came to dominate their local market with a large swathe of alcoholic beverages (including brandy, vodka and gin). While there are some US sales, not many bloggers have written about these rums, which may be too low-key or hard to find, to attract much interest. Most comments I see are by people returning from the Phillipines, or who live(d) there. Fortunately, I’ve been able to remedy this shortfall: in late 2017, a new FB aficionado and occasional commentator called John Go offered to send me some samples from around the region in exchange for some of my own, and the Tanduay 1854 was one of them. The cheerfully sneaky gent numbered his six unlabelled samples, so I had no clue what I was getting and that means that the notes below are my blind ones. “Thin and somewhat sharp on the nose,” my notes on this 15-year old blended, golden rum go, “But very interesting…could have been a bit stronger.” It was indeed an intriguing aroma profile – briny and a little vinegary, like salt biscuits smeared with a little marmalade, plus musty sawdust and spicy notes – tumeric and cardamon and cumin – redolent of a disused pantry left unattended for too long. What may have been the most interesting thing about it was that there were surprisingly few real molasses or “rummy” smells, though some caramel emerged after a while: overall it was far simpler than I had been expecting for something this aged. That changed on the palate, which was better (the reverse of the situation with many Caribbean rums where the nose is often richer and more evocative) – I had few complaints here aside from the feeling that 43-46% might have done the rum more favours. Mostly caramel, vanilla, some breakfast cheerios with milk lightly sprinkled with brown sugar and cinnamon, some cumin, citrus and oak. Mildly sweet, a little dry, some pineapples and bananas, with additional late-blooming flavours of brine, sweet soya, and finished quickly, without fuss, short, thin, sharp and just more citrus, vanilla, caramel to wrap things up. Overall it was workmanlike, not overly complex – it is well constructed, flavours are distinct, balance is fine…but there just isn’t much of anything to really write home about, no singular point of excellence. It’s simply a good 15 year old bottled at 40%, and could easily have been better with some beefing up or imaginative barrel strategy or finishing regime, and I think for a rum this old and at the top of the food chain for the company, that’s not an unreasonable critique to make. Sure it may be primarily for the East where softer fare is de rigueur…but one can always seek to raise the bar too. Still, let’s give Jack his jacket: compared to the high-test-swilling elephant in the rum room right now (the Don Papa 7 and 10 year old, which I and others excoriated for being mislabelled spiced and oversugared syrups), the 1854 is quite a bit better. Johhny Drejer calculated 5g/L of additives, which is right on the margin of error (0-5 g/L is considered to be effectively zero) and that is evident in the way it goes down. I think for all its relative simplicity and unadventurousness, it is tasty and straddles an interesting line between various different rum profiles; and has not only real potential but is an affordable, decent product that gives other fifteen-year-old standard-proof rums a run for their money..
FWIW, the bottle only costs P400 here. So it’s just a bit over 5 euros or under $8 USD with the current exchange rate. It really is affordable but I am curious as to why it’s this cheap. Likely lower taxes and state fees because this is for domestic consumption: the moment it gets exported there are tariffs, import duties, local / state/ federal taxes, transport costs and middlemen…as well as regulatory hoops to jump through and a distribution / sales network to pay for. All this gets folded into the foreign sales price. I don’t know enough about direct production costs or indirect infrastructure costs (electricity, water, maintenance, overheads, etc) for Tanduay to assess whether this impacts the final cost, though surely they are factors. where can i buy this tanduay here in cebu?